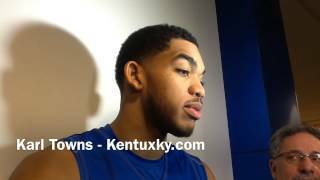 Kentucky freshman Karl Towns talks about defense against Ole Miss and being a target on the road. Cal Thomas: Why all the love for George Clooney? Bill Barkley, a 20-year employee of the U.S. Postal Service, sorted mail at the Nandino Boulevard center in July. The mail-processing center on Nandino Boulevard in Lexington will begin closing in June, according to a U.S. Postal Service schedule. The Lexington center is among 82 nationwide that the postal service plans to shutter in a new round of plant closings and consolidations. Mail-sorting operations now performed in Lexington are scheduled to move to Louisville. Some of those sorting operations were moved to Knoxville more than a year ago. The first phase of closing is scheduled to begin June 1, when the process for outgoing mail will be moved out of Lexington. Outgoing mail is all mail that is collected in the area that can go anywhere in the country. The Nandino center handles all outgoing mail for ZIP codes starting with 403, 404, 405 and 406. It includes Danville, Harrodsburg, Georgetown, Winchester, Mount Sterling, Paris, Richmond and Nicholasville. About July 1, the process for "destinating mail" will be moved out of Lexington. Destinating mail comes into the Lexington processing center for delivery in Lexington and surrounding areas. Postal service spokesman David Walton emphasized via email that the June 1 and July 1 dates could change. About 290 Lexington employees will be affected by closing the Nandino processing and distribution center. The bulk of the employees there are members of the American Postal Workers Union Central Kentucky Local 2307, which represents 176 clerks, 16 truck drivers and 64 maintenance employees, said Austin Speed, floor steward for the union. "We've started to resign ourselves to our fate," said Speed, a Georgetown resident who is a mail-processing clerk and who has worked at Nandino for seven years. "This is going to happen unless something happens in Congress," which he acknowledged was unlikely. In a letter released last month, 30 U.S. senators urged Postmaster General Patrick Donahoe to delay the start of any closings until the effect of the consolidations has been studied. Donahoe is scheduled to retire Feb. 1. The senators cited a post office inspector general's report that found the postal service had failed to fulfill regulatory and statutory obligations to study the effect of the consolidations on service standards and to inform the public of the effect. The postal service disputed the inspector general's report by saying it had met its transparency requirements. Kentucky Sens. Mitch McConnell and Rand Paul were not among those who signed the letter. Walton said the postal service was working on a response to the letter. As with past consolidations, "we have been able to place impacted employees in other positions without resorting to layoffs," Walton said. "Every effort will be made to reassign impacted employees when implementing this next phase of consolidations." Speed said the postal service would try not to lay people off. "But the conditions under which you stay on with the postal service can be less than ideal," he said. For example, Lexington employees will be given the opportunity to go into jobs within a 50-mile radius of Lexington. "If you can't find a job within that area, you become unassigned," Speed said. "That means you continue on at Lexington, you clock in, you get on a bus to Louisville and do six hours of work and then come home. Or you may be converted into another craft. You may go from being a clerk to a letter carrier or a maintenance worker." Walton was uncertain what will happen to the building on Nandino Boulevard when mail processing goes elsewhere. A full-service post office will remain there, at least initially. "We could sell the entire building and lease space back from the new owners, or we could sell the building and relocate the post office to another nearby site," Walton wrote in an email message. "Nothing is off the table at this point." The Nandino processing and distribution center opened in 1973. Closing it would save $8.7 million, including transportation and maintenance costs, the first year, Walton said last year. Consolidating the processing at the 82 centers is expected to save about $750 million a year, or $3.7 billion over five years, the postal service has said. The 141 consolidations that have been completed saved about $865 million a year. The postal service, which receives no taxpayer funding for operating costs, has recorded $26 billion in losses over the past three years and says it faces pressure from declining volumes of first-class mail, rising operating costs, and wage and benefit inflation. Last week, the postal service relaxed standards that will slow delivery for 14 billion pieces of first-class mail from overnight to two-day service. The postal service says the relaxed standards will help close a gap between revenue and expenses, including a congressionally mandated requirement to pre-pay billions of dollars in retiree health care costs. Copyright 2015 Herald-Leader. All rights reserved. This material may not be published, broadcast, rewritten or redistributed. Lexington Herald-Leader is pleased to provide this opportunity to share information, experiences and observations about what's in the news. Some of the comments may be reprinted elsewhere in the site or in the newspaper. We encourage lively, open debate on the issues of the day, and ask that you refrain from profanity, hate speech, personal comments and remarks that are off point. Thank you for taking the time to offer your thoughts.